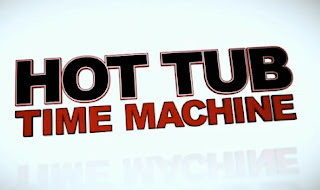 You've been seeing the funny commercials for it on TV for months now and tomorrow, Hollywood screenwriter Josh Heald's (W'00, Editor-in-Chief 34th Street Magazine ('99), Penn Jazz) Hot Tub Time Machine hits theaters nationwide. The film is about 4 friends who travel back to the 80s after they discover that their ski resort hot tub ends up being a time machine. Sounds pretty brilliant to me! Can't wait to see it! and what other Penn alum produced this film! "I sold the movie as a pitch last year. The title actually came first -- it was the result of a silly conversation with producer Matt Moore. 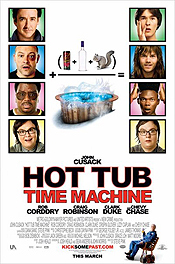 After six months of joking around about the title (and still finding it funny), we decided to sit down and try to figure out what a movie called "Hot Tub Time Machine" would actually look like. And the story was born there. MGM saw the potential and fast-tracked the project (filming commenced less than a year after the sale of the pitch, which in studio terms is incredibly quick). The movie was fortunate in attracting the amazing cast and director in short order. Having grown up on a steady diet of 80s movies, I had always wanted to write one. But I felt like I was in the wrong decade. "Hot Tub" gave me the freedom to celebrate all that was awesome about movies from the era, while still presenting a very relevant story for today. I didn't want to spoof the 80s -- I just wanted to see characters from today visit that world, with its different values and ideals. How would 2010 mix with 1986?" "If you were to take a dip in your own hot tub machine back to Penn 2000 [his graduating year at Penn], where would we find you and what would you be doing?" "If I took the Tub back to Penn 2000, you would most likely find me skulking around the DP offices, playing with Penn Jazz, and living in a flooded basement at 4029 Walnut Street with five friends (including Jon Hurwitz (W'00) and Harold Lee (W'00) -- the inspiration for John Cho's "Harold Lee" in the Harold and Kumar movies). And of course Smoke's - you could always find us there. You'd also find me shlepping around to management consulting interviews in Philly and New York and Boston, trying to convince interviewers (and myself) that I wanted to be a management consultant. It worked out briefly, as I would accept a job with Booz-Allen & Hamilton in San Francisco. Thankfully the dot com industry would bottom out and I would get laid off and move to LA to pursue writing, but that was all in my future. Still, if you asked me in May 2000 where I truly saw myself headed, I would tell you that I was "hoping to do a little TV writing" (I remember saying this into a camera that was filming the commencement day activities). I had some appreciation - but not much - for the hard work and luck that goes along with a writing gig in Los Angeles. Thankfully, as I would follow my passion, that naivety would come in handy, always making me comfortable that my big break was just around the corner... and eventually it was. 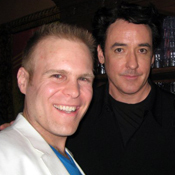 In early 2004, I sold two screenplays and I've been working constantly ever since." Josh tells me that while there are no overt Penn references in the film, he promises to make a whole bunch of Penn references on the next project! On a related note, there's more interesting Penn news to this movie getting made. 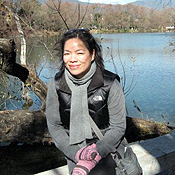 It turns out that one of the producer's on the film (who runs John Cusack's production company, New Crime Productions) is Penn alum Grace Loh (C'95)! Finally, in other Josh news, if you recall, last year I did a post about Mardi Gras, another film Josh wrote that he tells me was shot entirely on location in New Orleans and is awaiting release (hopefully later this year) by Sony Screen Gems. ...Between Josh and THIS producer alum, it seems like Penn alumni are capitalizing on event/holiday films!